On Now: Kura Pounamu: Our Treasured Stone features greenstone treasures from the collections of Te Papa and Canterbury Museums, including several large boulders from Big Bay, South Westland (Canterbury Museum collection). 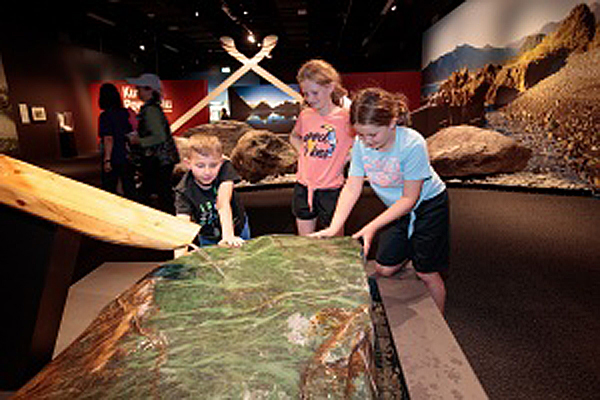 A record 802,595 people visited Canterbury Museum and Quake City, its special exhibition telling stories from the Canterbury earthquakes, in 2018. This is almost 38,000 more visitors than the previous record of 764,720 set in 2017. The Museum had record numbers in six of the last 12 months including 101,883 visitors in February 2018 (previous record February 2016: 91,150). This was also the first time that more than 100,000 people had visited in one month. Museum Director, Anthony Wright, says a number of very popular temporary exhibitions and increasing tourist numbers in the city contributed to the result. “It feels as though the city has well and truly turned the corner, not just in the number of tourists visiting, but more importantly with the number of locals coming back into the central city. With more of the Arts Centre reopening, the Margaret Mahy Playground and the stunning new Tūranga, there’s so much to explore in the city. “For the Museum, Quake City’s move to Durham Street North has been one of the year’s great success stories. We were concerned about having to move the exhibition in mid-2016, but its new location next to a tram stop and ongoing visitor interest in what happened here during the earthquakes, are driving record numbers to the paid-for exhibition. We’re absolutely thrilled with the result,” he says. In 2018, a record 62,780 people visited Quake City exceeding the previous record of 55,227 set in 2013, the year the exhibition first opened.